The forecast for the weekend was warm, in the mid teens during the day and only slipping down to about -2 in the cold hours of the early morning. We have spent a lot of time in less benign weather so we decided that it was time to cut the cord. No electricity this weekend. 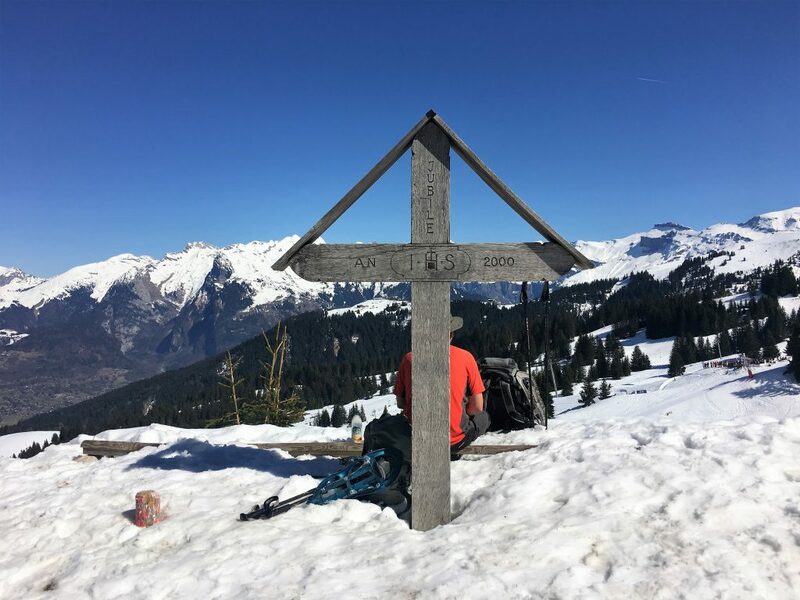 We had a bit of a cast about for some decent skiing in these spring like conditions and decided on Flaine as having slopes above 2000m and being in roughly the right direction (towards the Mont Blanc tunnel). It didn’t look like we could park up in Flaine itself, or at least not easily, so we decided to base ourselves in Les Carroz d’Arâches. Les Carroz is part of the Grand Massif ski domain, linked to Flaine and other village resorts (including Samoens where there is a well thought of campsite). We made our way from Les Saisies, stopping for a quick top-up shop and to do some laundry. With sweet smelling bedding (it wont last long!) we drove onwards towards Les Carroz, slightly perplexed by the difference in mileage on our sat nav versus google maps. As usual when there is a difference of opinion I got out our paper map of France. France was the country where we first trialled our motorhoming before we’d purchased a sat nav, so we bought a 1:200,000 scale map. I really would like one for every country we visit, it makes it much easier to plan routes when you can see the different road classifications in different colours. Anyhow the paper map showed that google was taking us the right way, the sat nav was trying to take us along unclassified tracks. We realised that the reason for this was a rocky overhang with a 3m height limit. Of course it is easily avoided by moving out into the middle of the road, and generous passing places are provided, but the sat nav doesn’t know that. It’s a good job we didn’t follow it’s instructions blindly. Finally parked up outside the swimming pool in Les Carroz we pondered whether this was really an acceptable overnight parking spot. So we popped to the tourist office to get their seal of approval as well as a few maps and other bits. With the comfort of their approval we relaxed in the sunshine and eventually two French vans turned up to join us. A bit of investigation had resulted in a slight change of plan for the following morning. Instead of getting the gondola from Les Carroz we would drive further up the mountain to get access to better snow. 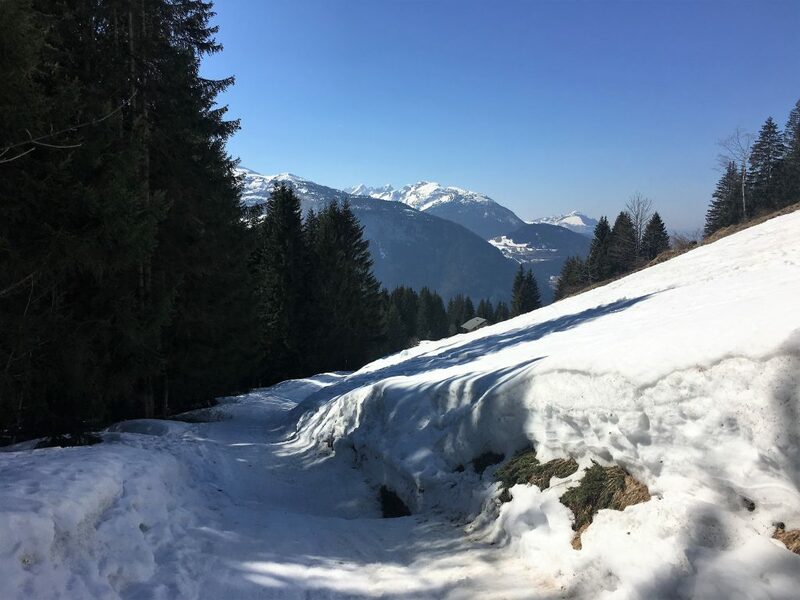 We were up bright and early for our drive towards Flaine, pulling over regularly to allow the cars behind us to progress – we thought they might be workers trying to get to the slopes in time for opening and we didn’t want to hold them up. We spent the day skiing Flaine from the Vernant car park, experiencing that spring time change from hard ‘corduroy’ (ridged groomed slopes that look just like the fabric but shake every bone in your body) in the morning to slow mushy slush in the afternoon. Although we got some good skiing in we decided that the following day was unlikely to be pleasant, night time temperatures were going to stay pretty mild, so we would go for a walk instead of skiing. We drove back down to Les Carroz for the evening and re-installed ourselves in the same spot we’d left that morning. The next day we enjoyed a slow start, popping out to get bread from the bakery and making up some scrummy brie and salami sandwiches for our lunch (it’s a good job we’re burning calories) before heading out on a snowshoe walk. That evening we took advantage of the final hour special offer at the swimming pool/spa. It was lovely to swim outdoors and get some lengths in. I even managed to do some front crawl rather than old lady breast stroke, all thanks to the bargain goggles (less than 2 euros) we’d purchased from Intersport. After our swim we used the sauna and spa area until we were thrown out for closing time. I think I left half my body weight behind in dead skin cells – it’s a good job it was closing (and cleaning) time! There are no longer any motorhome services (that we are aware of) in Les Carroz. The tourist office confirmed we could park in the swimming pool car park for a couple of nights. We were joined by two other French vans over the weekend and a further van was turning up as we left so it does get a reasonable amount of use. On the way to Les Carroz we also passed the Spar supermarket in Araches-la-Frasse where a few motorhomes were parked. I think you could also get away with parking at the Vernant car park (further up in the direction of Flaine) in low season. To get to the swimming pool parking you have to drive through the one way system of Les Carroz. It’s actually fine although at one point you might feel you are just driving into a hotel car park. Google maps provides accurate directions or you can follow the signposting. There is a Casino supermarket in Les Carroz, open 7 days a week. There is also a small bakery above a ski store as you walk from the swimming pool towards the Casino supermarket. As you can probably guess there is a swimming pool. It’s very expensive at €17 per person because you get access to both spa and pool. Annoyingly there is no swimming only price. For best value go after 6:30pm and it’s only €8. The pool shuts at 8pm (and they mean it) but it makes it pretty good value for sauna, steam, indoor spa pool and outdoor swimming pool. If you’re tempted to go in earlier then take a book or some music and you can chill out on a sun lounger in between visits to the spa facilities to get your money’s worth – there is no time limit apart from closing time. The free bus (line A) goes past the swimming pool every 20 minutes and it’s really reliable. The best thing is that you see it go past (uphill) and know you have about 4 minutes to get to the bus stop as it comes back downhill. Plenty of time to pick up skis, lock the van and get on the bus. It goes to the Les Carroz gondola station and takes about 6 or 7 minutes. However we didn’t use the bus for skiing, instead we drove up to the Vernant ski lift and parked for the day in the large car park. This meant we could get a lift pass just for Flaine and we could ski back to the van for lunch. Flaine is the highest part of the Grand Massif ski area. It has a good range of red and blue runs which mostly funnel down into Flaine itself. From Flaine you can connect to Les Carroz, Samoens and other villages available through the Grand Massif lift pass but we decided to just get a Flaine area pass for the day as conditions were very spring like and we didn’t feel it was worth the extra. Vernant parking is where they try to direct most day visitors because it keeps them out of Flaine. From Vernant you have to take two lifts to get over into the Flaine bowl, but they are high speed lifts so it’s painless. To get back from Flaine you have to get the Grands Vans lift and then ski down blue and green to the car park. The top of the blue might feel a bit steep for a beginner but it is very wide and easy to avoid other people, to make it easiest follow the Grenant run rather than Dolomie. 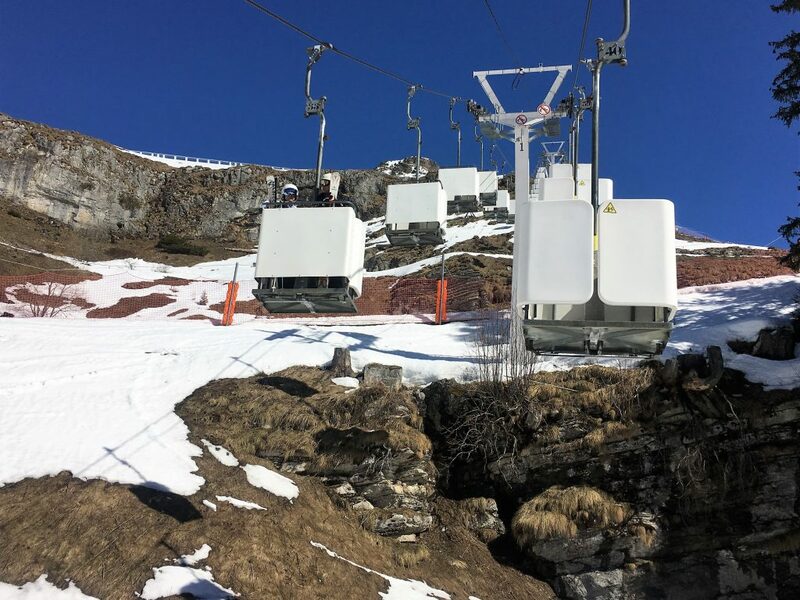 This was a very odd ‘standing’ lift in Flaine. It didn’t stop, you had to run (waddle) after it to get on and then step backwards off it at the top. Although the chair lifts and gondolas are quite modern there are also more drag lifts than usual. Some of which were classed as difficult, quite arm wrenching at the start and steep in sections. The red runs from the Desert Blanc chair are ungroomed pistes and the one we did was quite interesting/lumpy, it was easier to ski off-piste. The day lift pass for Flaine €43.20 and for the Grand Massif is €47.90. You can get 4 hour passes for a shorter day, particularly useful in spring conditions when you’re unlikely to enjoy the skiing after 2pm (or maybe that’s just us). We didn’t investigate the on-piste snow shoe routes (I assume there are some, but we didn’t even look), however there are also unpisted snowshoe paths which are marked with pink (magenta? puce?) signposts. The map of routes from Les Carroz is available from the tourist office and online here. Although routes 5 and 6 leave from the Swimming pool carpark (and plenty of people were enjoying a weekend stroll while we were there) there was little chance that any snow still existed at this low level. We decided to get the free bus to the lift station and walk up routes 2,3 and 4. From the lift station you walk back towards town and take the first road on the right which rises up between chalets. On the second bend there is a car park and from here route number two is signposted. We were surprised that snow was lying on the path even at this low altitude, but the trees must keep it pretty shaded. At first this path ran below the ‘combe’ blue run but soon the ski run ascended out of view and we could no longer hear the wet schussing of skiers in slush. The trail was really busy with walkers, some with snowshoes and some just in walking boots. It was Sunday after all and many people were avoiding the unpleasant spring conditions on the ski slopes. 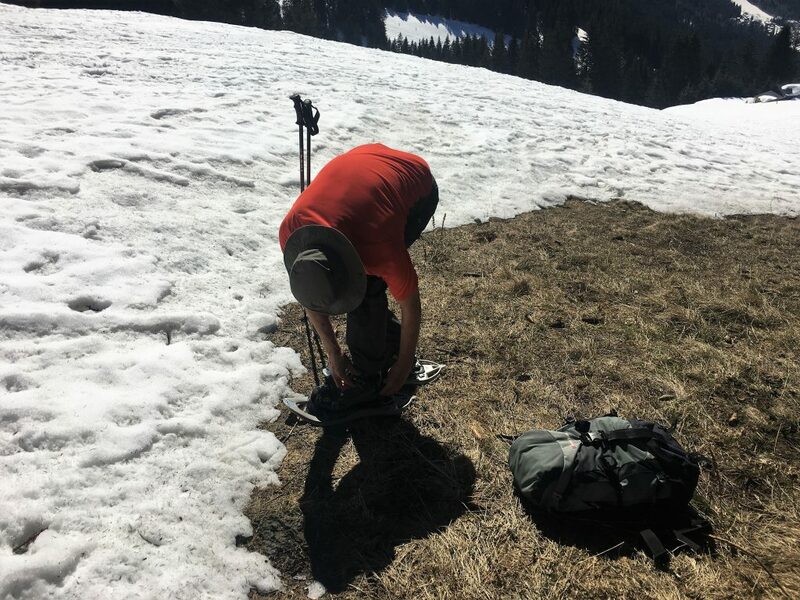 We felt a bit over prepared with our snowshoes strapped to our backs, and in truth they weren’t completely necessary, but they did make life a bit easier for the last part of the ascent and to maintain grip on the descent. We reached a junction where routes 2,3 and 4 joined. At this point we headed onto trail 3 which took us upwards through forest and eventually out onto open slopes where the snowshoes finally found a purpose. We passed through an unpopulated hamlet and over the mound that was the Malatrait viewpoint. To our surprise the cluster of buildings below this viewpoint included a small restaurant where people were enjoying their lunch. People had ski-toured over here from the slopes of Morillon and Samoens. A signpost just behind the restaurant gave the direction for the climb up route 4 to the Croix des 7 Freres. This is a brief offshoot of walk 3 that ascends up to the ski slopes. Crossing the slope and climbing through the woods bought us up to the wooden cross where we sat and watched skiers on the pistes of Morillon while eating our lunch. Retracing our steps back to the café we continued on route three down slippery slopes back to the junction with route 2 and then followed the ongoing signs for route 2 back down to the car park. 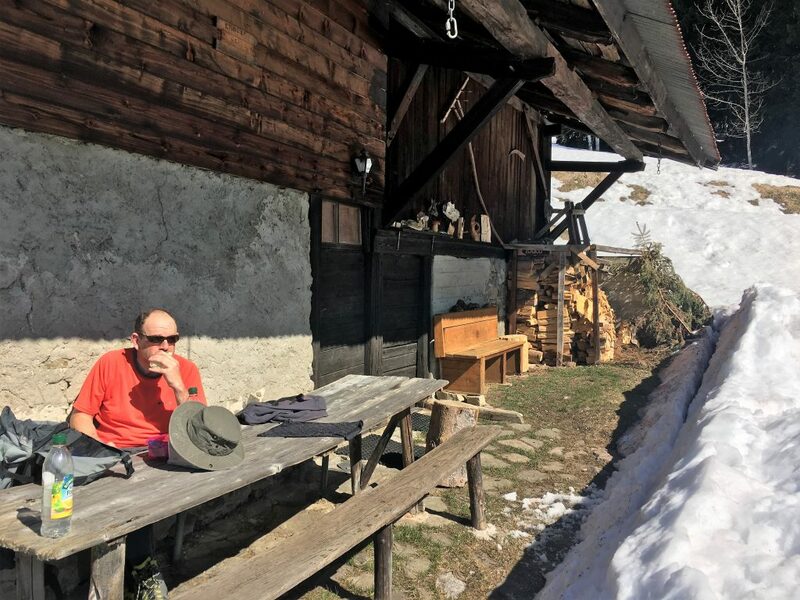 We stopped to eat the remains of our lunch outside an unoccupied chalet in La Lanches. We didn’t take our snowshoes off until we ran out of snow, about half way down route 2. For a final moment of excitement I followed Paul climbing up a snowbank to the road. I sank up to my thighs, having a moments panic as I tried to prise myself out and just flailed around unable to gain any purchase. Rather clumsily I managed to claw my way out while Paul laughed. All in all a very satisfying snow shoe walk, I think each individual route would be a reasonable morning or afternoon stroll, but put them together and they make a more substantial hike.